On March 7th, Farfetch hosted the WIN LDN community for our London chapter’s first corporate innovation event -- “Disruptive DNA: How Farfetch is revolutionising the luxury ecosystem while building a world class company.“ Rallied by our Farfetch ambassador Chiara Gatti, women leaders from across Farfetch came together to share what they’ve learned leading innovation and change from within one of the fashion world’s fastest growing tech companies. Sian Keane, Chief People Officer at Farfetch, opened up the event by sharing lessons learned over her leadership tenure helping to grow Farfetch from less than 100 people to over 3,000 globally today. 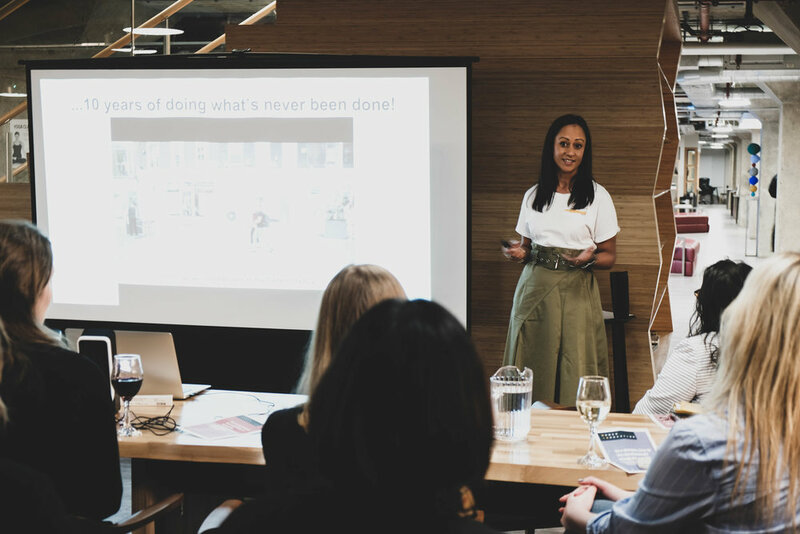 She shared how at Farfetch, the leadership team continually debates how to balance various healthy tensions within their culture - tensions between innovation and optimisation, between global and local, and between fashion and tech. 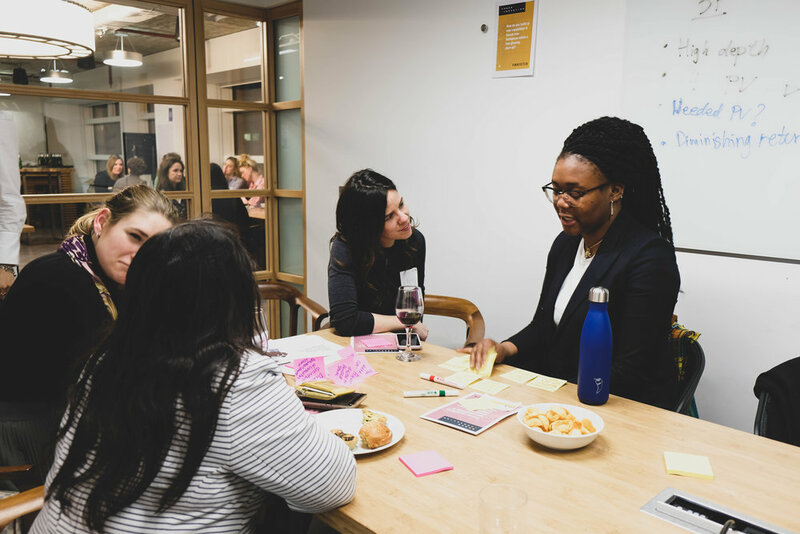 To further explore the concept of ‘Disruptive DNA’ and what it means within different contexts, we asked our five women leaders to share challenges they face or have faced in their day-to-day work. 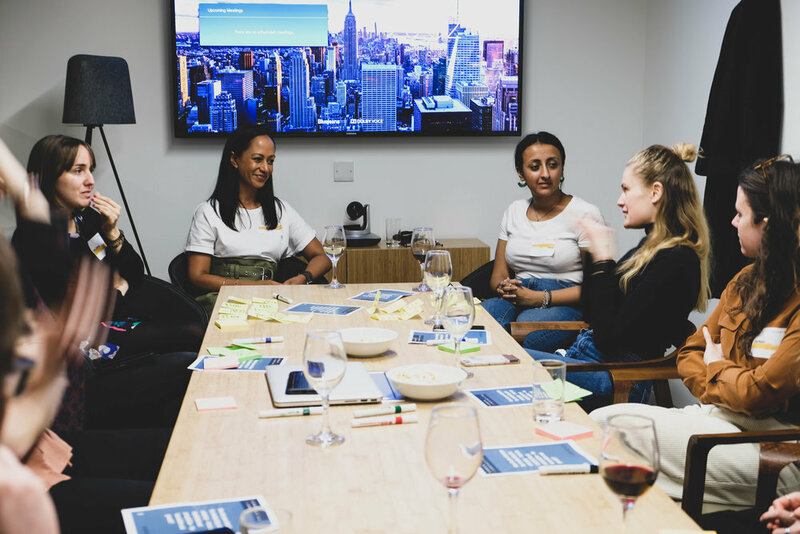 Each attendee picked the prompt that they were most excited to discuss and participated in breakout groups with the leader and facilitated by members of Farfetch and WIN. After a series of lively discussions, all of the groups reconvened and shared back their group’s Disruptive DNA Manifesto, which we’ve captured and shared for you here! If you want to hear some words of wisdom from the mouths of the Farfetch leaders themselves, check out the video. How do you maintain an innovative approach when your everyday focus is on delivery and client satisfaction? A true innovative approach requires you to put human at the center of everything you do. As a leader, create a space for your people where it’s safe to make mistakes, show and don’t tell, be scrappy and focus on delivering a product that meets the core customer need. Do things differently every single day and develop infrastructure, processes and functional tools that reinforce the culture you want to build. How do you structure the leadership of a company - from an organisational perspective - for innovation and growth? Innovative leaders provide a consistent message on innovation and what it means for their team, both in a long-term and day-to-day perspective. They are learners themselves and facilitators of their team’s work, processing and acknowledging challenges and failures to enable a learning culture. They strive to be visible and model what innovative behavior looks like, continuously trying to inject change into the organisation and create a mindset where all can thrive. How do you build up new capabilities or launch new businesses within a fast growing start-up? Vision is built from both the bottom up and top down. To build a successful startup within a startup, have a clear vision but give the team a mandate to think long-term and not be focused on quarterly milestones and reporting, adopting a “we are never there” mindset. Create structures that promote a culture that values new ideas and ways to test and experiment. And know that quick wins distract from true innovation and a long-term focus. How do you balance art and science in innovation and manage commercial and aesthetic tensions? Develop and deliver - have a clear manifesto, use an agile methodology, and set a creative brief within the boundaries set by science. Assess the value of new ideas by using a combination of customer perception metrics and financial KPIs. Above all, to truly take an art and science approach, you need team members with a diversity of perspectives and backgrounds who can negotiate this tension and provide a balance between innovation and optimisation. As a disruptor, how do you simultaneously change the way the industry works while bringing other players along on the journey? When introducing new technology and innovative business models to other players, it’s essential to come to their side, find what matters to them and start where they are. Define a shared success model that’s win-win and above all, connect to people’s why taking into consideration their purpose as well as their passion. To earn their trust, make sure that you have skin in the game and you will be able to create a community of like-minded people. We came away inspired by these Disruptive DNA Manifestos which address challenges that all of us face in our organisations, be it startup or corporate, agency or freelance. Thank you to Farfetch for hosting us - we couldn’t have imagined a better first corporate innovation event for a London community!